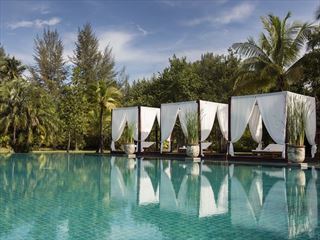 The elegant and boutique La Flora Resort & Spa is located right at the beautiful golden sandy beach of Bang Niang. 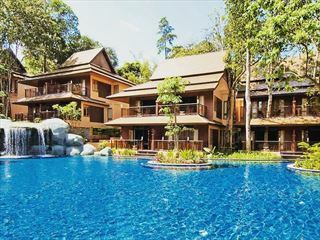 Only a one hour ride from Phuket International Airport, the property offers a choice of thirteen exclusive villas, as well as various types of deluxe rooms, all designed in finest contemporary Asian style. Just off the resorts shore you can enjoy snorkelling at Pakarang Reef and the enchanting Similan Islands with their world-famous diving grounds. The resort offers a total of 138 design driven rooms, studios and villas, all with private balconies and terraces. The Deluxe Studio rooms are located on the ground floor and offer 48 square meters of luxury and relaxation. In addition to the furnishing of the “Deluxe Rooms”, the studios also feature walk-in closets and a large bathrooms with separate shower and bathtub, as well as day beds overlooking the gardens. The special concept of the Pool Access Rooms is the direct connection of their patio with the new free-form pool. Besides the relaxation in the adjacent pool, the spacious 45m2 rooms provide a cosy atmosphere of selected modern interior, featuring King-size beds, comfortable day beds and elegant bathrooms with Jacuzzi-tub and separate shower cabin. The Garden Villa and Seaview Villa are similarly furnished, they also features beautifully designed interior and specially comfortable furniture, as well as TV, DVD-player, sound system and mini-bar. The very spacious 55 m2 villas offer the choice of either one King-size mattress, or two singles, placed on a wooden platform in Thai-style. An extra mattress can be placed on the platform for a 3rd person and the large day bed can be used as sleeping accommodation for an additional child. The large veranda leads into the gardens and offers plenty of room for leisure and relaxation. The Garden Villas are located in the gardens towards the beach and the location of Seaview Villas are close to the beachfront, these villas boast the best sea views of the resort. No doubt, the highlight of the luxury Jacuzzi Villa is the private sea view whirlpool and sun-deck. But the Villa as a whole makes a statement of its own. A total area of 150 square meters allows for two bedrooms, one with a King-size bed and one with two single beds, two exclusive bathrooms, a comfortable living room and a terrace. The spacious living room offers seating, television, sound system and a mini-bar in classy ambiance. The master bedroom features a special dressing area, as well as an extra TV. La Flora offers two appealing, yet entirely unequal swimming pool experiences. The first, right on the beach, you can choose to dive or take a snack at the pool bar. The second pool is a large free-form pool which nestles through the resort, creating many tiny private bays. It has Jacuzzi-jets in many locations. The free form pool is directly linked to the kids pool which features permanent lifeguard surveillance and latest rescue technology. At La Flora, fine cuisine is part of the holiday experience. Excellent chefs and courteous waiters are looking forward to enriching your stay with exciting a-la-carte dishes and grand buffets. 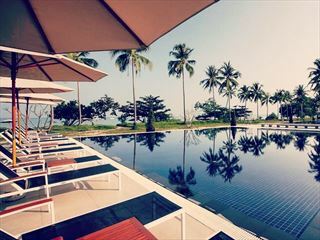 The View 59 Restaurant is located directly on the beach, offering breathtaking views of the Andaman Sea. The menu ranges from Thai to international cuisine, with the special delicacy of freshly caught seafood served every day. On your request, the hotel will be glad to arrange a romantic sunset dinner on the beach, accompanied by assorted wine, or exotic cocktails. Themed buffet nights are arranged regularly these include a Thai night, Italian buffet and European buffet night. Listed in the Conde Nast Traveller Readers 2013-2017 Top 20 Hotels in Asia and Sub Indian Continent, The Sarojin is designed in a contemporary Asian style and beautifully set on a 7 mile secluded white sand beach, providing endless walks and all year round swimming. This is the ultimate romantic retreat.